This dish captures the taste of summer and a spirit of ease, but it’s also a bit more dressed up than my stand-by summer tomato sandwich. I can pick up nearly all the ingredients at my local farmers market throughout the late summer. Although I’ve made it at home more often than not, it makes a light summer dinner or lunch that always reminds me of life at the beach. 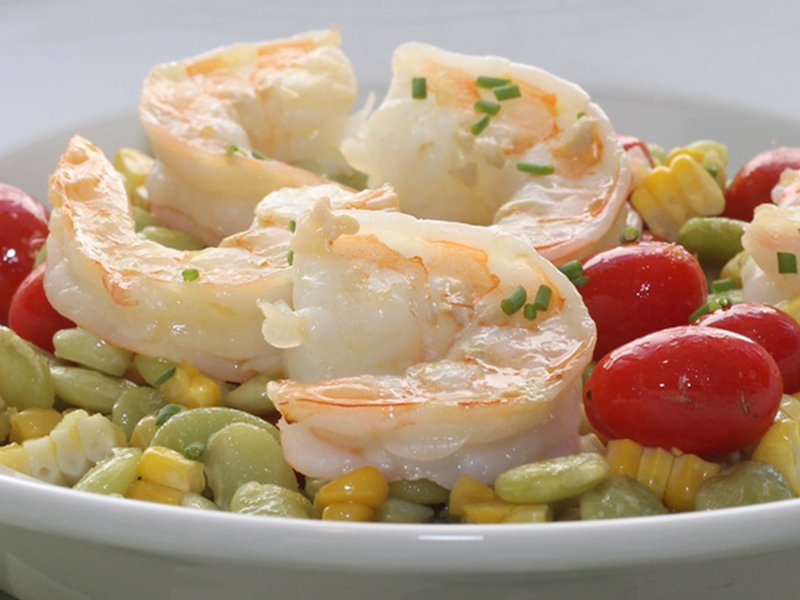 If you can buy your shrimp fresh off the boat and stop at a farm’s roadside stand for the corn, butter beans, and tomatoes, this will taste like the very essence of a summer afternoon. Heat the olive oil over medium-high heat in a large skillet. Add the onion and cook until it is soft and translucent. Add the garlic and cook about 1 minute, stirring. Add the shrimp, sprinkle with salt and pepper to taste and cook for about 2 minutes on each side, until the shrimp has just turned pink. Transfer the shrimp to a plate and set aside. It’s okay if there is still some onion in the pan. Add the cooked lima beans and corn to the hot pan, sprinkle with salt and sauteé for about 3 minutes, then add the tomato halves and sauteé for 2 minutes longer. Adjust seasoning to taste. Off the heat, fold in chopped chives. Finish each plate with ribbons of julienned basil. Serve warm or chilled.